I feel compelled to write this because I often see pets whose ears are dirty. Not necessarily infected but just need a good cleaning. When I ask pet owners how they are cleaning their pet’s ears, the answer is usually that they don’t clean their ears, or they describe a process that is just plain incorrect. Many pet owners tell me they use alcohol or hydrogen peroxide to clean their pet’s ears. Some tell me they use olive oil or mineral oil. Others tell me they use warm water. If you are one of these pet owners, please read on, because all of these are NOT to be used to clean ears. The first thing you will need to keep your dog or cat’s ears clean is some ear cleaner. There are several types of ear cleaner available either from your veterinarian or your local pet supply store. If you are unsure what kind to purchase, ask your veterinarian for advice. Next, make sure the ear cleaner is room temperature. Using cold ear cleaner will be uncomfortable for your pet. With the bottle of ear cleaner inverted, point the nozzle into the ear canal and give the bottle squeeze or two. This will allow the ear cleaner to go deep into the ear. Next you want to massage the base of the ear. You will usually hear the liquid in the ear as you massage. This will break up the debris/wax that is deep down and help bring it to the surface. Now, you will need plenty of cotton balls or soft gauze pads. These will be used to wipe the debris/wax out of the ears. Please do NOT use toilet paper, paper towels, or tissues to clean the ears. They may be very abrasive and tend to break apart unlike cotton balls or gauze pads. Continue to wipe the ears until you stop seeing the debris on your cotton ball or gauze pad after wiping. If you see blood at any point during the cleaning, stop, and make an appointment with your vet. The ears may be very inflamed and/or infected. Repeat with the next ear. A lot of pets do not care for having their ears cleaned, but it is something your pet can get used to and even learn to like if it is paired with a favorite treat or activity. Also, be sure to clean your pet’s ears routinely instead of waiting until they become infected. 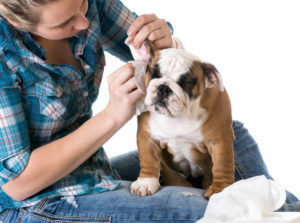 Oftentimes, infected ears are swollen and painful, and it will be difficult to get your pet to cooperate for an ear cleaning if they have never been through it before. Please note, if your pet is having any signs of an ear infection (odor coming from the ears, constant shaking of the head or scratching of the ears, inflammation), please see your veterinarian before attempting ear cleaning. If the eardrum is damaged in any way, this type of cleaning may do more harm than good. If you are concerned about your pet’s ears or need further advice, give us a call at 706-671-1900 or come by to see us!